This week the children have been hugely inspired by the Blue Planet Live series. We have taken part in the live lesson and from that they all decided they would like to make leaflet to rise awareness of the decline of sharks in our oceans. They have organised a cake sale and a raffle to raise money for the Bite Bake Shark and Marine life conservation charity. 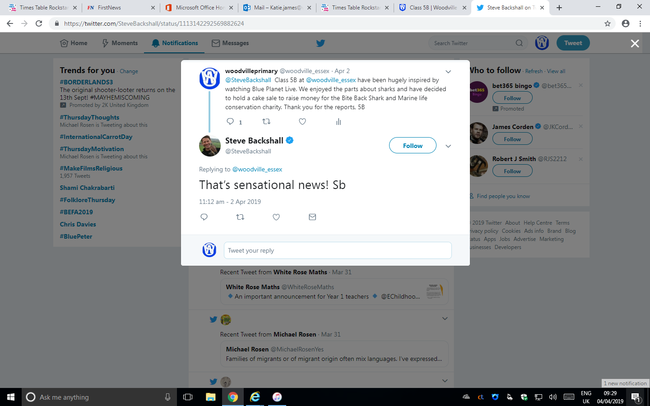 On Tuesday we sent a tweet to Steve Backshall, one of the presenters and the children were so excited to receive a reply today! A week of child led learning and we have loved every minute. A very proud teacher. We had a great time at William De Ferrers yesterday and really enjoyed our lesson with Mr Mason. We learnt all about reversible changes and were able to test how chemicals can join together to create reactants and can’t be reversed. We were also able to burn things! It was a very exciting lesson. We had a great time learning a dance routine to 'Revolting' from the Matilda musical. Rachel, who is a dance teacher, taught us a fantastic dance which we then performed to the rest of the juniors. Every year group learnt a different dance and they were all really good! Children should have brought home a letter for our trip to WDF on Wednesday. We are very fortunate to have the opportunity to go and work with Mr Mason again in the labs to improved our understanding on Materials and their Properties. Please make sure your children have returned the slip by Tuesday at the latest. We had a wonderful day for our Portals to The Past day. Our teacher was very knowledgeable and showed us lots of interesting armour. He talked to us in old English and taught us an Anglo Saxon game. Year 5 Christmas holiday project. Please bring in your completed work by the 7th January. Don’t forget that we have a Portals to The Past, dress up day for Anglo Saxons on the 29th January. We have written some excellent speeches imagining that we are astronauts stranded in space. We have used some brilliant language and will soon be recording them in front of a green screen. We we have had a ‘friendship’ workshop where we have looked at how we become upstanders rathaer than bystanders when we see something unpleasant happening to another person. We looked at what bullying looks like and how we can recognise it. We used drama and role play to think about our responses. We are also rehearsing our songs for our play which is coming along nicely! Science museum on Tuesday. Be at school for 8am ready to leave by 8:15. Don’t forget your packed lunch. Costumes to be in by next Friday if possible. Please let us know if you are struggling with this. Thank you to everyone who has returned their Science Museum Letter. We are now fully staffed for this trip so do not require any more helpers. Christmas play: year 5 will be taking on the role of Marley’s ghosts for our Christmas play ‘Ebenezer.’ Please can they have a Victorian Costume which is shabby and ‘ghostly!’ Feel free to customise the outfits. We would like them in by the 30th November. If anyone has any fake chains left over from Halloween could we please borrow those too. Achievment assembly for year 5 is the 30th November. 5B really desperate for any toys for our Golden time. We really like playing with Lego, Loom bands or other craft activities. If you have anything at home you no longer play with that you would like to donate, we would be very grateful. For homework this week instead of MyMaths, we are asking the children to learn the first 12 square numbers. They will be challenged to recall them to a class teacher or LSA by Wednesday 17th October. Square numbers are numbers which make a square i.e 2x2, 3x3, 4x4 etc. If you have any unwanted games, puzzles or craft that you would like to get rid of, we would be very grateful to receive them for Golden time and Wet play. Please make sure MyMaths, First News and Times Tables Rockstars are being completed. Currently only 18 out of 30 children are completing their homework! This is set to help consolidate the learning that we have done in class and is vital for improving understanding. I check homework weekly and follow up any issues that may have occured. We have been very busy these last few weeks and are getting stuck into the year 5 curriculum. Take a look at the photos of the children's wonderful summer homework. Below is an attachment of the Meet the Teacher handout for your information. Your pencil case shouldn't be too big and should have: a handwriting pen, glue stick, ruler, rubber, pencil sharpener, colouring pencils (if you choose). Make sure everything is labelled! In the second week of the term we will begin our swimming lessons on Friday afternoons. A letter will go home with you this week. Please bring in your Mayan homework by Tuesday 11th September. Times Table Games - Hit the Button!